The SM Store “Share Shoes” campaign. Donate pre-loved and brand new shoes at The SM Store from February 15- April 15, 2019 and help give new shoes to Caritas and SM Foundation beneficiaries. Give the less fortunate children and families a gift of new pairs of shoes this year with The SM Store’s “Share Shoes” campaign. Shoes are essential in our life’s journey. And for less fortunate children, a new pair of shoes will allow them to walk safely as they perform their daily chores and go from home to school. Good shoes also inspire us to work hard because with new pairs of shoes, we can start taking little steps towards achieving our dreams. In this joint project of The SM Store and SM Shoes Department, booths have been set up in all The SM Store branches nationwide. 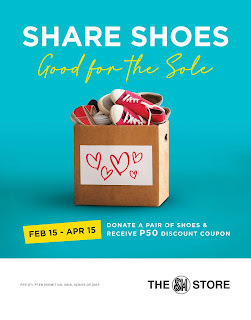 Shoppers can now have the chance to donate pre-loved and brand new pairs of shoes from February 15- April 15, 2019. SM Shoppers can purchase these new shoes from The SM Store Shoes Department and donate these to this year’s “Share Shoes” campaign. All donated shoes will be for the benefit of Caritas and SM Foundation beneficiaries. Share Shoes is one of the ways The SM Store and its customers work together to share blessings to the less fortunate. These donations will certainly bring hope and smiles to all beneficiaries nationwide. Other upcoming projects are Donate-A-Book; Give the Gift of Wellness and Share-A-Toy 2019.